Puts a heavy duty sling mount anywhere on rail forend. 4140 steel, Colt style 1.25 inch loop. Loop is rubber coated for stealth. Base is machined from solid 7075 alloy aluminum billet. Interfaces directly with Picatinny (MIL STD 1913) mounting rails. Uses the same 9/64" Allen wrench as all UltiMAK AK optic mounts. As the use of the modular forend rail system, such as the UltiMAK ACR2 has become more prevalent among armed citizens, three-gun match competitors, special operations personnel and law enforcement SWAT teams, the ability to easily mount a sling to the dovetail rails has become necessary. 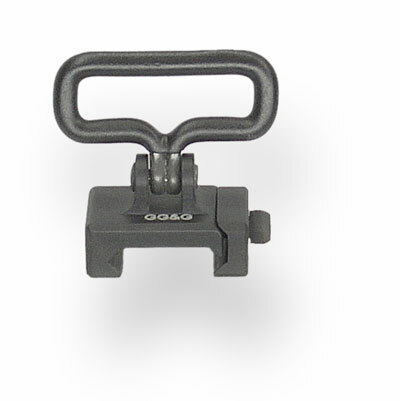 For this reason, GG&G developed a Sling Thing specifically for dovetail applications. 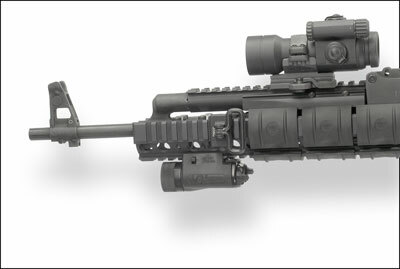 It provides the user with the flexibility to place the front sling attachment anywhere on the multi rail forend that suits the user's mission requirement. A lightweight, durable, easy-to-install and inexpensive method for front sling attachment, it uses a Colt style 1 & 1/4-inch sling loop. Manufactured from tough 7075 billet aluminum and black hard-coat anodized, it is 100% American Made.